I took this photo of the Canyon Pack in November. 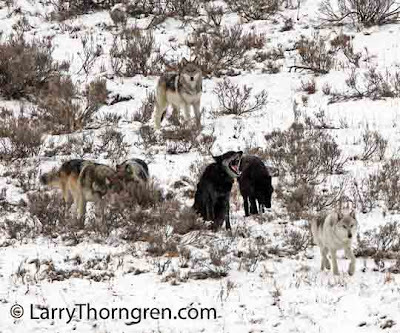 The pack consists of three adults and three pups. The three adults are the ones in front. The yawning black wolf is the alpha male and the very light gray wolf in front is the alpha female. The pups do not get their adult teeth until December and are not much help in hunting until they are a year old. These pups are about eight months old. It was thought that the two gray pups had disappeared, but there are reports that all six wolves have been spotted near Mammoth Hotsprings in Yellowstone.